Delta has continued its winning streak in the UK by being named Best Airline to North America at the annual Business Travel Awards. The accolade comes just four weeks after Delta took home the Airline of the Year award at the TTG Awards. It is the first time Delta has won the award since 2013, besting competition from American Airlines, United and Air Canada. 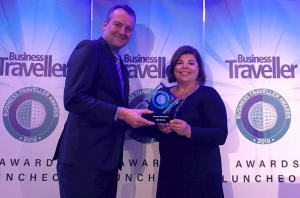 The Business Traveller Awards are the gold standard of the British travel industry and encompass a range of categories for airlines and airports plus hotel, rail and car rental firms. Each year, the event attracts a well-known guest speaker with Michael Portillo, former Member of Parliament, taking to the stage this year to present the awards. Delta’s partner, Virgin Atlantic, retained their title of having the best Premium Economy cabin – an award category it has dominated for a number of years.